Man O’ War was considered the yardstick for greatness in racing for most of the twentieth century––and still is by some. The original “Big Red” was a tall, rangy powerful chestnut with a star and stripe on his face and the look of eagles in his eyes. A fast horse out of the gate, he was almost impossible to pass, except for that one really bad start that cost him his only loss, to a horse aptly named Upset. 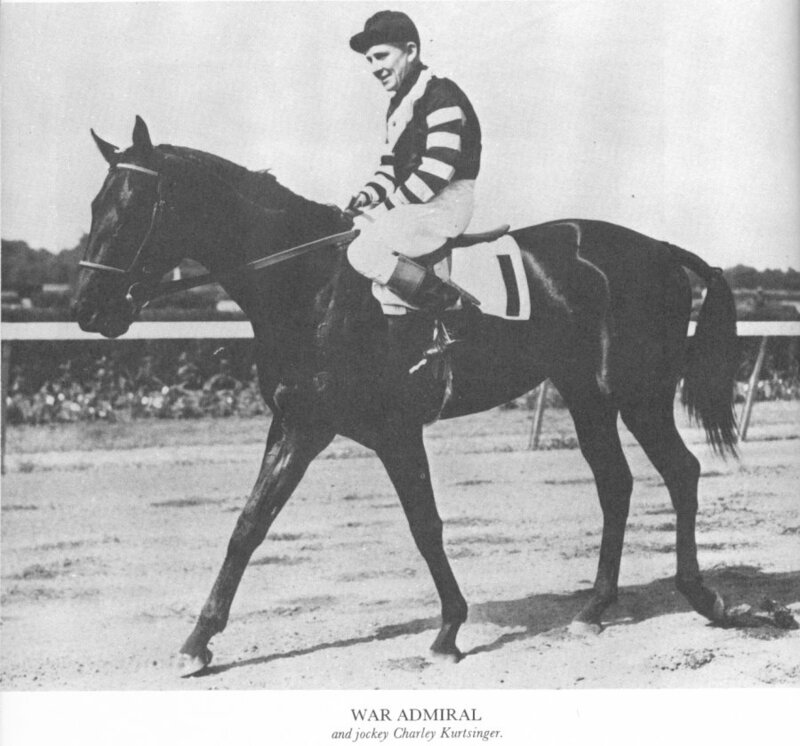 War Admiral was his best son, amongst some fine stakes horses. Two horses couldn’t have looked more different: Big Red tall, some claim 16.3 hands, and lean; War Admiral muscular and compact, only standing 15.3. Man O’ War a gleaming red chestnut, the Admiral a solid dark brown, almost black. Nevertheless, the two shared a blinding speed and feisty spirit that brought them home first over some very good competition. War Admiral, nicked named the “mighty Atom” for compressing such a concentration of speed and power in such a small package, was foaled at Riddle Faraway Farm, the home of his magnificent Dad and owned by Samuel D. Riddle (who raced both horses). As a two year old, the colt’s record was respectable, though not spectacular: three wins in six starts, including one stakes race (Drager 62, Robertson 318). Still, he showed both promise and spirit, which he fulfilled by going unbeaten at three. In the Chesapeake Stakes, he trounced the winners of the Flamingo and the Santa Anita Derby, leading Samuel Riddle to break his rule of not running in the Derby for the first and only time (Riddle felt that early in May was too soon to ask a three year old to go 1 1/4 miles). After War Admiral caused an eight-minute delay at the starting gate (the spirited colt loathed the confinement), he shot to the lead and stayed there to romp home by 1 3/4 lengths over the good Pompoon (Drager 62, Robertson 318). The Preakness proved an even more thrilling race, with Pompoon’s jockey sending the colt to challenge War Admiral early and the two staging a furious battle on the lead. War Admiral prevailed by just a head (Drager 63-65, Robertson 318). Interestingly, Robertson claims that the victory was more authoritative than it looked, with the Admiral decisively turning back every attempt Pompoon made to move ahead (318). 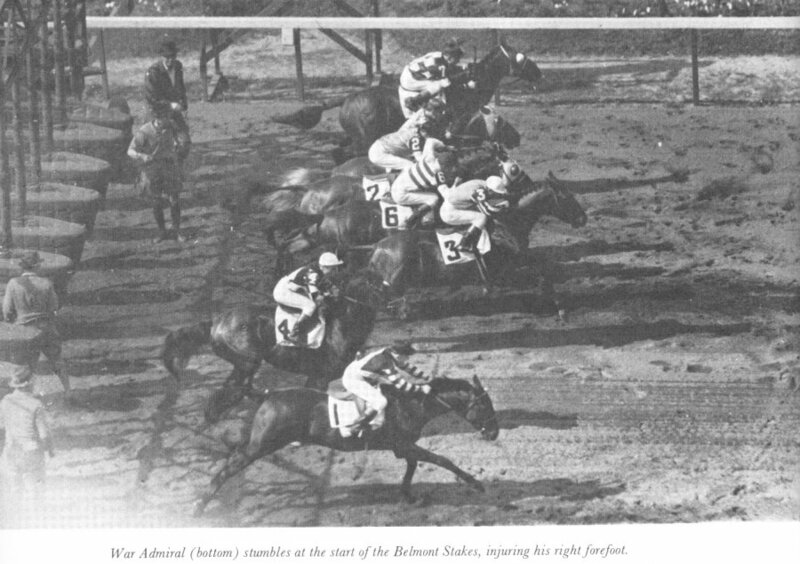 The Belmont Stakes was a particularly impressive victory, and not just because War Admiral led from start to finish as if he were on a sprint rather than a 1 1/2 distance run––or because he tied the American record for the distance of 2:28 3/5 (Robertson 318). War Admiral left a trail of blood behind him as he trotted to the winner’s circle because at the start of the race, during his hijinks, he had “shear[ed] off a piece of the wall of his right forefoot” (Keller qtd Robertson 318) and “run the race without noticing” (Robertson 318, Drager 68). You can see his accident in the photo above. War Admiral was out of action for four and a half months, but when he was back in action, he racked up wins in the Washington Cap and the Pimlico Special (under 128 lbs! ), to take Horse of the Year Honors for 1937 (Robertson 318). That year, another horse was making headlines, the rag-to-riches handicap star you may have seen a movie about: Seabiscuit. The Biscuit and War Admiral missed meeting in 1937 when the former was pulled out of the Washington Cap, and 1938 proved to be a year of exciting rivalry for handicap and horse-of-the-year honors between the two. Both horses won big and racked up high earnings; both horses carried high weights to victory over the top stakes stars of the year. After several near misses, the two finally met in a winner-take-all match race for $15,000 (not chump change in 1938). Anyone who’s been to the movies in the past few years knows how that turned out. Tom Smith used shrewd training techniques to get the Biscuit to break fast and put on an early burst of speed. For the first time in a long time, War Admiral was headed, almost literally, out of the gate. The Admiral made several runs at the Biscuit, but it was the older horse who finally prevailed (Drager 73-82, Robertson 325-26). Still, War Admiral hardly suffered a broken heart, turning around shortly afterward to trounce his rivals soundly in Rhode Island Cap under 127 lbs. at the old ’Gansett in Rhode Island. War Admiral came back to racing at five; owners weren’t afraid to ask their horses to prove themselves (without necessarily over racing them) in those days. He took a prep for the Widener, then was se t back, first, with laryngitis, then with a bowed tendon, and retired (Robertson 326, Drager 83). Marvin Drager (83) suggests that War Admiral got his “revenge” on Seabiscuit by having a far more successful breeding career, siring Busher, War Jeep, and Busanda (the inestimable Buckpasser’s Mom). However you look at it, War Admiral did his Daddy proud. Sources: The Kentucky Derby: The First Hundred Years (Peter Chew); The Most Glorious Crown (Marvin Drager); The History of Thoroughbred Racing in America (Willaim H. P. Roberston).